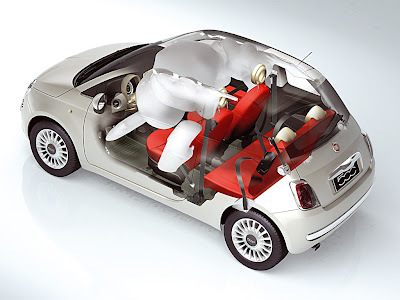 This is the second part of a 2 part posting in which we'll discuss how the Fiat 500 achieved its high safety ratings. In the first part, we discussed the assumption that small cars can't be safe. 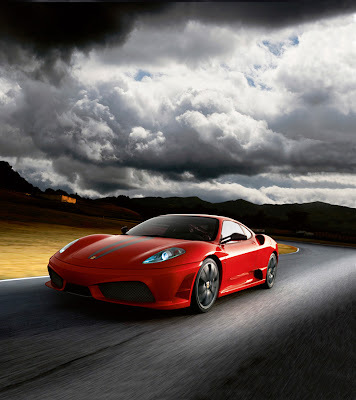 Ferrari F430- Another car under the Fiat stable. 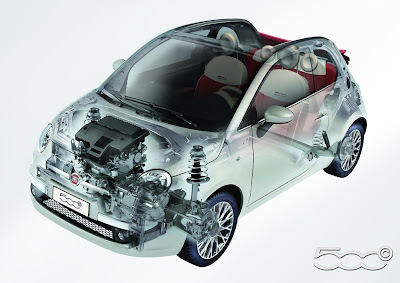 Safety at all cost with no impact on pricing... this was the mantra of the new Fiat 500. 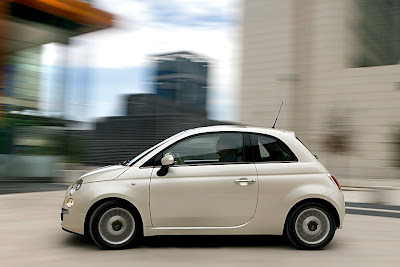 Fiat, the company responsible for Ferrari, Maserati and Alfa Romeo, put all of its engineering talent into designing the Fiat 500 to be the first sub compact car (3.55 meters or 139 inches) to achieve a 5-star crash rating. Indeed, it is also ready to achieve the 6-star crash rating if and when that rating is introduced. The Fiat 500 striking a deformable barrier at 64kph (40mph). Notice how the windshield /A pillar keeps its relative shape. longer and 546 pounds heavier than the Fiat 500. How this was achieved was no accident, but a conscious decision by Fiat to safeguard its owner and passenger. 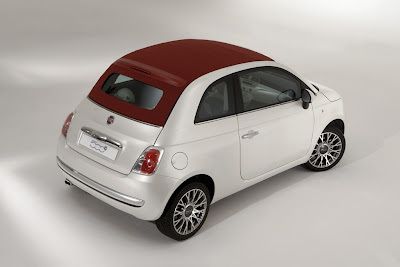 In 2007, the world’s most prestigious prize for car bodies was awarded to the Fiat 500. The car bodies are judged on the basis of a variety of evaluation criteria, including use of innovative materials, innovative solutions for development, design and the manufacturing process, and values that are significant for the customer, such as safety, ergonomics, acoustic comfort and quality. The 600 specialists, from 15 international car makers, gave the award to the Fiat 500, assigning it 38.33 points out of a possible 50. This enabled the “small” Fiat – the only segment A model present – to defeat the other 11 candidates from Japan, the United States, Europe and Russia. 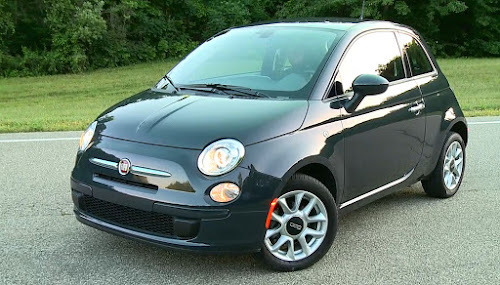 In view of the fact that the award had never before been assigned to a subcompact in its entire eight-year history points out that the Fiat 500 is not the typical small car Americans are used to. 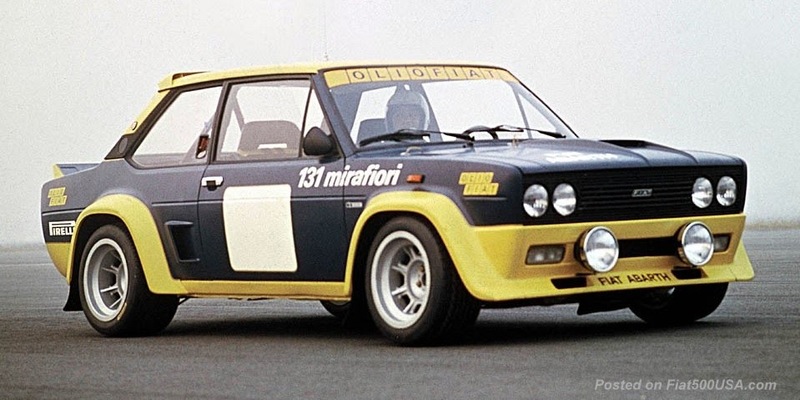 Listed below were the competitors to the Fiat 500. Notice the prices of the cars that the 500 beat. 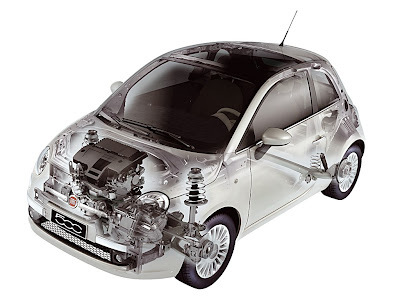 The body shell of the Fiat 500 is made with (expensive) high tensile steel. It is rigid around the passenger compartment to protect occupants and has high-absorption areas on the outside. It is the first super-mini with a front structure designed specifically to improve compatibility between vehicles in a head-on impact. 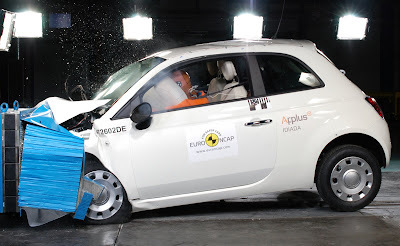 The forum was particularly impressed by the innovative bodyshell’s contribution to winning a 5-star EuroNCAP rating and high marks in insurance crash tests: a feat that puts the Fiat 500 at the top of its class in safety and is all the more remarkable considering that the car is a mere three and a half meters long. It marked the first time that a compact car had been built to achieve a 5-star rating in the EuroNCAP impact tests. 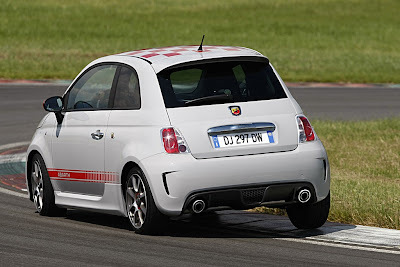 Additionally, the Fiat 500 was designed for the future 6-star test. an impact and safeguard its occupants. Besides its strong body shell, the Fiat 500 is equipped with many safety features: 7 airbags as standard equipment (it is the only compact to offer a kneebag), Seat-belts with double pretensioners, pedal support designed to break away at set impact threshold, FPS fire prevention system, front and rear seats with antisubmarining crossbeam and an advanced ESP available with all engines (standard on the 100 bhp 1.4 16v engine). for chest/pelvis protection, 2 window-bags and a driver knee airbag.! The new model is the first car in this category to offer up to 7 airbags (front, side, curtain- and knee-bags are all standard throughout the range, except for the Naked version). 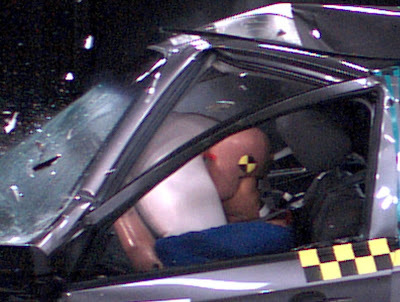 The front passenger airbag may be deactivated via the menu of the vehicle’s on-board computer; a dashboard warning light indicates this condition. The seatbelt pretensioner remains active, however, so a rear facing baby seat can be safely fitted. Seat-belts with double pretensioners and load limiters are standard on the front seats. These pretetensioner devices instantly tighten the seat belt to take out any dangerous slack in the event of an accident. These are the types of belts found mainly in premium vehicles. They are rarely seen in cars of this size. Three-point belts are fitted at the rear. The front and rear seats are also fitted with antisubmarining devices that prevent the occupant from sliding forward, under the seat-belt. Isofix (LATCH child seat) mounting attachments are standard throughout the range. 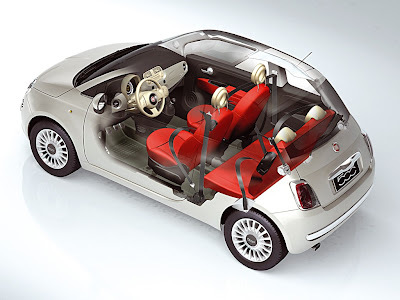 The pedal assembly on the Fiat 500 moves out of the way in the event of an impact. This helps protect the feet and legs during a collision, eliminating a major source of injury. This feature is usually reserved for high end luxury cars, not cars in this size class. The FPS Fire Prevention System includes a cut-off valve and an inertia switch which immediately stops the electric fuel pump to prevent fuel loss in the case of impact, roll-over or damage to the fuel lines. The fuel tank, located in a protected position in front of the rear axle, is resistant to mechanical stress and fire. The 500's interior trim is also flame resistant. Fitted as standard equipment on all models, switchable automatic door locks can be activated on all doors as soon as the 500 reaches 12 mph – an important safety and security feature. The braking system on the new car has two independent cross-over circuits to guarantee prompt, smooth braking and shorter stopping distances. The pedal has a short stroke, so that the characteristics of the servo assist are exploited in full. The front discs have a diameter of 240 mm; they are solid for versions with the 1.2 8v engine and ventilated for the 1.3 Multijet, with a diameter of 257 mm for versions with the 100 bhp 1.4 16v. The rear brakes mount drums (180 mm) on the 1.2 8v and 1.3 Multijet, and discs (240 mm) on the 1.4 16v. The 9” brake servo makes braking easier and more effective, decreasing the effort needed on the pedal. The ABS on the Fiat 500 has four active sensors, four channels, a hydraulic control unit with eight solenoids and comes complete with EBD (Electronic Brake Distribution). The system can guarantee the best possible braking effort even with each wheel close to locking, which means it is possible to control the direction of the car fully in emergency situations using the steering wheel. The strong points of the system are the active sensors, which process the wheel speed data themselves (without having to send them to the control unit); they can read values very close to naught (most cars use passive sensors which do not register speeds below 2.5 km/h) and are less sensitive to disturbance caused by electromagnetic fields. This advanced ABS system is supplemented by electronic brake force distribution, EBD, which distributes the braking force between the front and rear wheels to prevent the rear wheels from locking, guaranteeing a balanced response from the car in all conditions. The system also adapts to the grip conditions of the wheels and the efficiency of the brake pads, and it reduces the temperature of the front brakes and the effort demanded from the brake servo. The new Fiat 500 offers the sophisticated Electronic Stability Program to guarantee complete control over the car; this program cuts in when conditions are close to the limit, and the car’s stability is at risk, to help the driver to control the vehicle (the device is standard with the 1.4 engine and an option with the other two). To do so, ESP constantly verifies how the tires grip the ground, longitudinally and laterally, and if the car does skid, it cuts in to recover the trajectory and trim stability. It incorporates sensors that measure the wheel speed, the vehicle’s rotation around its vertical axis (yaw speed), the lateral acceleration and the steering angle set by the driver (which indicates his chosen direction). It then compares these data with the parameters processed by a computer and uses a complex mathematical model to establish whether the car is taking a bend within the grip limits, or whether the front or rear is about to veer (understeer or oversteer). To bring it back to the correct trajectory, the system generates a yaw moment opposite to the one that caused the instability, singly braking the appropriate wheel (nearside or offside), and reducing the engine power by adjusting the throttle valve. This is where the device developed for the Fiat 500 differs from other systems. Its intervention on the brakes is modulated to be as gentle as possible (therefore without disturbing the driving), and the reduction in engine power is limited, to guarantee excellent performance and enjoyable driving at all times. ESP is always engaged. To limit any slipping of the driving wheels when grip on the road is poor, the new Fiat 500 is equipped with a sophisticated device that controls traction automatically. It is known as ASR (Anti Slip Regulation), and is standard equipment on all versions that mount the ESP system. ASR functions at all speeds and adjusts torque on the basis of the grip detected. • if only one wheel slips (for example the wheel inside a bend following acceleration or dynamic changes to the load), this is automatically braked without the driver having to press the brake pedal. The effect obtained is similar to that of a self-locking differential. ASR helps to maintain vehicle stability, and it is particularly useful when there is a loss of grip (just think of the ramps in a garage in Winter) and when the paving does not guarantee homogeneous friction. Another advantage of ASR that should not be overlooked is the reduction of stress on mechanical organs such as the differential and gearbox, which is achieved by controlling take-off and traction at low speeds. ASR is engaged automatically every time the engine is started, but can be excluded by a switch on the center console. When ASR is activated a telltale on the instrument panel flashes. If the telltale in the control panel comes on, but the LED on the switch is off, this indicates a malfunction or irregularity in the system. ASR must be de-activated when snow chains are mounted, because in order to transmit torque to the ground, the wheel has to be able to ‘pile up’ snow with small slips that the ASR system tends to avoid. If the driver changes down suddenly and grip is poor, the MSR device (Motor Schleppmoment Regelung) takes over, returning torque to the engine and preventing slipping due to wheel lock. 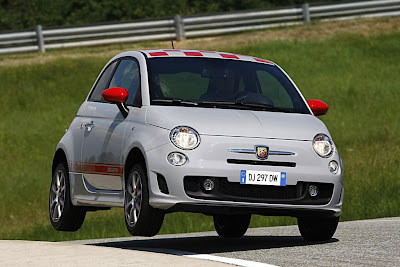 The Fiat 500 adopts a device that assists in emergency braking. On cars fitted with ESP this function is performed electronically by the ABS control unit and it is called HBA (Hydraulic Brake Assistance). During ‘panic’ braking, most drivers recognize an emergency situation and put their feet down very rapidly on the brake pedal, but not with the necessary additional effort. Because, unless he is a professional driver, the motorist is accustomed to braking by applying a certain ‘load’ to the pedal, and like all automatic gestures repeated over and over again, he tends to use the same effort in all circumstances. On the new model, at this point the Brake Assist devices are triggered, and although the pressure on the pedal remains the same, they ensure the same deceleration that you would achieve by braking with every possible force. The panic braking assist is also useful for more expert drivers who do brake rapidly, and with the right amount of energy when necessary. Because in any case the system reduces braking implementation time, i.e. the time between the moment he applies the force on the pedal and the moment that the circuit reaches maximum pressure and can give its best performance. The Hill Holder is a system that helps the driver on hill starts. It cuts in when the ESP control unit perceives a difference in the inclination of the car through a longitudinal acceleration sensor on the floor under the front passenger seat. During a hill start, the control unit prepares to intervene when first speed is engaged and the brake and clutch pedals are depressed. The pressure on the front brake calipers is maintained for about 2 seconds after the driver releases the brake pedal, allowing him to set off without difficulty. The Hill Holder is not activated when the car is started downhill with first speed engaged. Similarly, when reverse is engaged, the system is activated for downhill starts, and it is not activated for uphill starts. 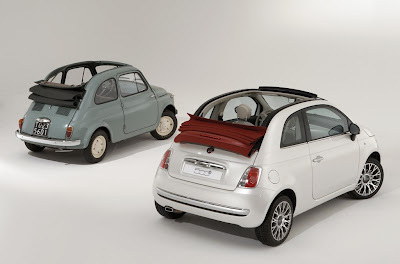 Fiat pulled out all the stops when it came to designing the Fiat 500. The safety features, designs and thought that went into the 500 befits cars costing two or three times its price. 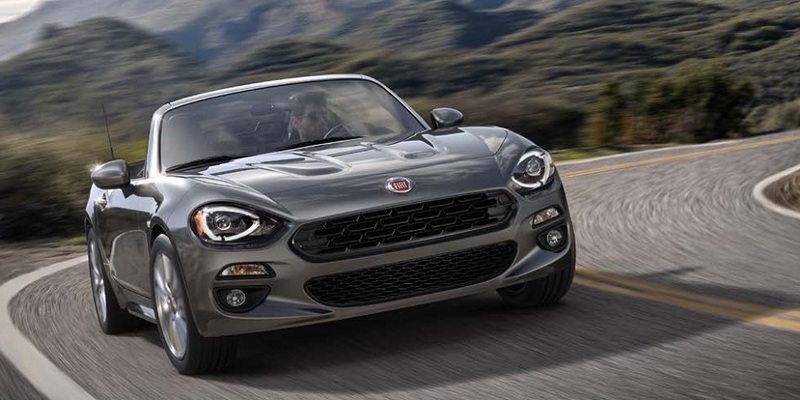 Safety at all cost with no consideration of pricing... it is in the best tradition of Fiat, a company that has a long history of giving the average person access to the latest and best in automotive design and engineering. From the ground breaking Topolino of the 1930's, the Nuova 500 of the 1950's, a car that gave a generation of Europeans access to real automotive transportation, the 1966 Car of the Year Fiat 124 that offered modern features and engineering in an affordable package and the breakthrough 1969 Car of the Year Fiat 128, the car on which all modern front wheel drive cars are based on. Each one of these cars and all the other Car of the Year winners Fiat has produced have always put people first. Fittingly, the company's motto is "People first, then cars." 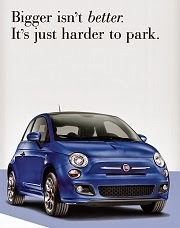 It is this legacy that is carried on with the new Fiat 500. In an indication of the faith people have in Fiat's management and vision during these economic hard times, Fiat, yesterday, announced the closing of its recently issued € 1.250 billion ($1.78 billion) Senior Notes due in 2012. The offering was extremely successful and drew more than €10 billion ($14 billion) in orders from investors for the €1.25 billion three-year bond. The bond was issued to help Fiat refinance debt. The bond sale was so successful Fiat is expected to offer more latter in the year. It shows investors are confident in Fiat's ability to weather the financial downturn and emerge strong. For reference, here is the break up of who owns Chrysler. Fiat has an initial stake of 20%, but that will increase in increments by up to a total of 35 percent in the event that certain milestones mandated by the agreement are achieved. 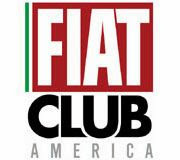 Fiat cannot obtain a majority stake in Chrysler until all taxpayer funds are repaid. Fiat Second Quarter Results...losses cut and maybe a year end trading profit of $1.3 billion. Here's a recap of Fiat's second quarter results. 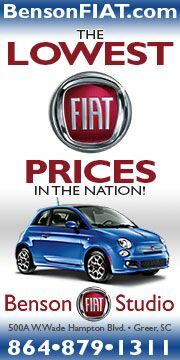 Fiat seems to be on target for the year, cut its debt by 900 million euros ($1.2 billion), which was higher than expected, and hinted that business could show some improvement in the last quarter of 2009. Below you'll find an overview of the report plus the forecast for the rest of the year. IN AN EXTREMELY DIFFICULT TRADING ENVIRONMENT, FIAT GROUP CLOSES QUARTER WITH €310 MILLION TRADING PROFIT (2.4% TRADING MARGIN). NET INDUSTRIAL DEBT DOWN MORE THAN €0.8 BILLION TO €5.7 BILLION WITH LIQUIDITY INCREASING TO €6.4 BILLION. • Revenues of €13.2 billion were down 22.5% over Q2 2008, with volume declines experienced in all businesses. effective management of operating leverage. million in net financial expense. • Liquidity increased to €6.4 billion (€5.1 billion at the end of Q1). efforts started in the latter part of 2008.
major portion of the year, with signs of recovery only visible in the 4th quarter. • Global demand for our products will decline ~20% compared to 2008. • Group trading profit will be in excess of €1 billion. • Restructuring charges of ~€300 million and other unusual costs ~€200 million. • The net result for the Group will be in excess of €100 million. debt levels below the €5 billion mark. 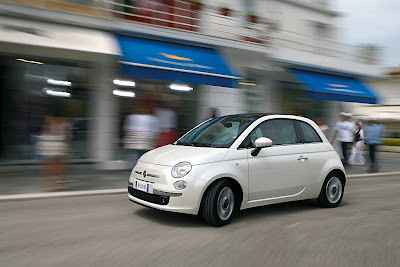 July 4, 2009 marked the 2 year old birthday of the Fiat 500. Birthday celebrations were held all over the world. 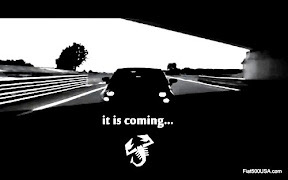 Here is the official video courtesy of YouTube and the fiatontheweb channel. Represented in the video are celebrations in: Milan, Rome, Naples, Athens, Bruxelles, Tokyo, Berlin, Casablanca, Gdansk, Ljubljana, Copenhagen, Cyprus, London, Madrid, Munich, Paris, Riga, Vienna, Volendam, Istanbul, Buenos Aires and Johannesburg. Enjoy! Let's take a detailed look at the new Fiat 500C with the help of Fiat & Abarth Style Director, Roberto Giolito. "The Fiat 500C is not only the "open" version of the 500 launched in July 2007," explains Roberto Giolito, Fiat & Abarth Style Director. "In fact, thanks to the wide range of available versions, this new model is really a whole new car in its own right, with a strong personality inherited from the original 1957 model and an undoubted sentimental value brought to it by so many fans over the years. If, on the one hand, the Fiat 500C respects the original version, on the other it enriches it with new features which, thanks to stylistic choices, afford each one of us maximum freedom of use". between the windshield and the glass roof panel. First of all, the front of the car differs for a slightly higher windscreen needed to resize the upper cross member; this gives a better view for the rear passengers, a stronger body and superbly clean lines. 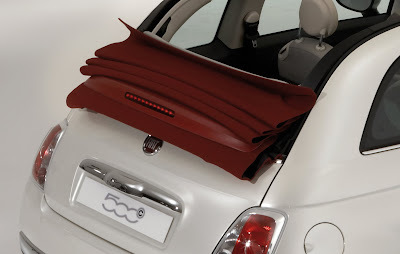 These are also enhanced by the continuity of the windscreen, which extends to the fabric roof without exposing any part of the bodywork (an extremely elegant and technologically sophisticated solution in keeping with the spirit of the 500C). another is 15 inches, with a more fluid design (both wheels have the classic cup-shaped locking nuts embossed with the 500 logo). But it is the rear aspect of the new car that is most different, particularly the clear division between the upper fabric part and the car's steel bodywork, emphasized by chrome trim like that of the 500 versions from 1957 onward. This stylistic element makes the rear of the car appear wider by creating a horizontal line across it. In addition, the rear window (in glass with an electric defroster) is more rounded. While retaining the same visibility as the 500 saloon, its smoother corners are closer in design to its 1950s forerunner. Another important feature of the new car is the boot: this opens upwards without protruding from the shape of the vehicle (this means there is no need to step away when loading luggage). In addition, if the soft top is down, an electronic device lifts it a few centimeters to allow the boot to be fully opened. This is an extremely functional and streamlined solution which can be appreciated both for its usability, and for the way it integrates with the vehicle. It should be stressed that the Fiat 500C is "best in class" in its segment for the ease and versatility of loading and unloading. Merit for this goes to the spacious luggage compartment (with a capacity of 182 liters - just three liters less than the saloon version), the traditional upwards-opening boot and wide access. Finally, the soft top of the new convertible comes in three colors (ivory, red and black) to match the numerous body colors (six pastel, three metallic and two opalescent). Some of these are inspired by the vintage colors of its forerunner while others are up to date and boast a really contemporary look. 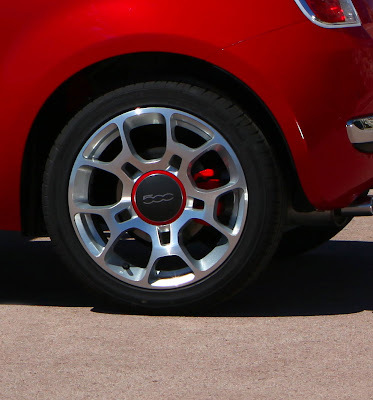 Among these, three were created specifically for the Fiat 500C: pearlescent Ragamuffin Red, Tech House Grey (typical of high performance super cars) and elegant Goth-Metal Blue. (The latter is available for the whole range). 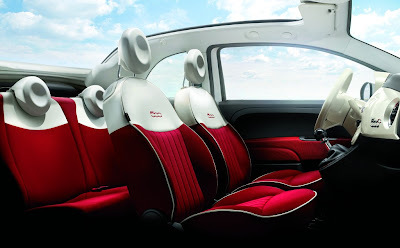 The interior of the Fiat 500C is equally exclusive, and boasts top quality materials. 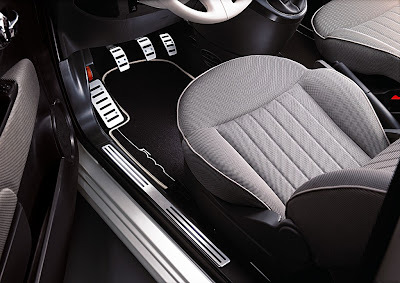 In particular, the new sporty seats are upholstered in a high-quality fabric which constitutes an important feature of the car for its feel and durability. The back and cushion of the rear seats are very enveloping and the side panels are upholstered in leather. 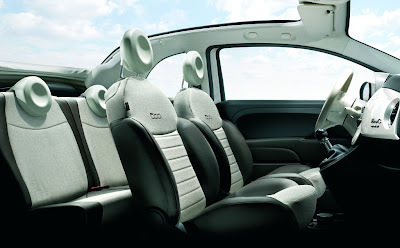 As an optional extra, the interior of the Fiat 500C can be upholstered in black, beige or red Frau leather. The chrome trim and a dashboard that matches the exterior color and is decorated by an exclusive 500C logo complete an elegant and functional interior that can comfortably accommodate four people. to its excellent coefficient of drag of 0.33. 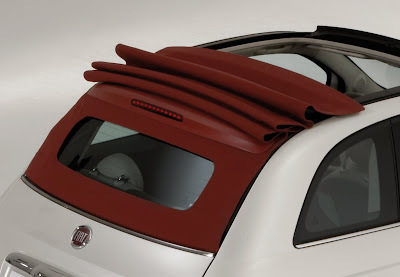 The soft top of the Fiat 500C is a true object of design, characterized by a sophisticated electrically controlled movement and innovative technical solutions. In particular a molding of the same color on the soft top acts as a spoiler and houses a third brake light, creating similar aerodynamics to the saloon version and a Cx of 0.33. This excellent figure puts the Fiat 500C at the top of its class, and is achieved by an optimized rear spoiler profile and rear wheel covers. light that can still be seen when the top is down. The comfort of the rear passengers has also received special attention, as pr oven by an air-flow speed of 7 m/s with the roof open. In addition, when the soft top is down, the spoiler is arranged so that the third brake light can always be seen. The double-layered roof fabric ensures the best possible insulation from the outside and, along with the internal coverings of the pillars, completes a superb finish for the mechanisms controlling the opening and closing of the roof. at any speed, like a big sunroof. The automatic electric soft top can be controlled either by buttons near to the interior ceiling light or from the remote control. In addition, the soft top can be operated throughout its horizontal travel (as far as the spoiler) at any speed. Vertical movement can be engaged at any speed under 60 km/h (37 mph). operated by a remote control. The soft top is also easy to use: to open it, just press the button for at least half a second to trigger the movement that then continues automatically up to the spoiler (a midway point can of course be chosen by pressing the button again). Press the button again for at least half a second to fully open the roof. When using the remote control, the roof can be opened only as far as the spoiler. The same processes will close it; for safety reasons, the roof stops at around 25 cm from complete closure (just press the button again to complete the movement). When the boot is open, the soft top can only be closed (the opening function is de-activated). However, if the roof is fully open and the boot needs to be opened, when the boot is opened the soft top automatically moves to a midway point to avoid obstructing loading operations. 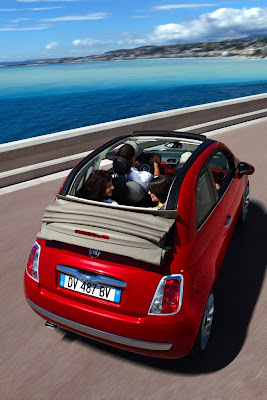 The exciting new Fiat 500C was launched over the weekend on July 4, exactly 2 years after the launch of the new Fiat 500. It was previously unveiled at the 2009 Geneva Motor Show in March. The Fiat 500C is coming to America, along side the regular 500, the Fiat 500 Abarth and the yet to be released 500 Giardiniera. 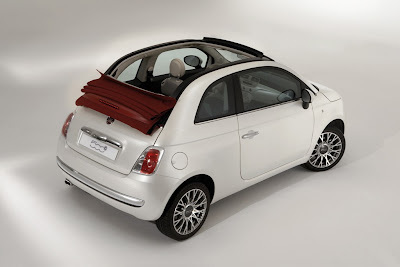 Come take a look, with the help of Fiat Group Press, at this open roof version. 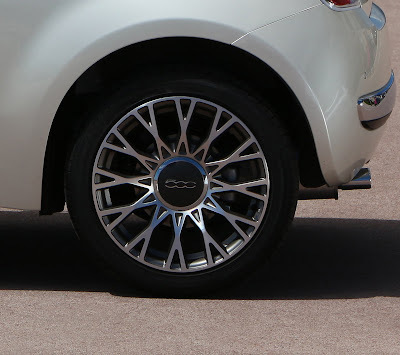 The Fiat 500C was created by the Centro Stile Fiat design centre with input from enthusiasts all over the world via the website the "500 Wants You". This is in keeping with Fiats philosophy of "a car for the people, by the people"..
Based on the sedan version, it has identical dimensions but has the added feature of a folding electric top. The top design is similar to the type that was on the original. 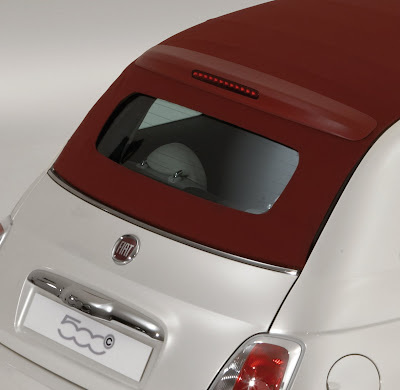 "..The decision to re-interpret the original design in modern key, with an electric sliding roof but a stylistic design that retains the shape of the classic car makes the Fiat 500C less of a seasonal product and one that can be enjoyed the whole year round. 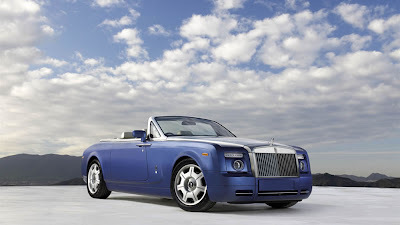 In short, all these features make this new vehicle one of the most successful convertibles in the modern city-car segment." 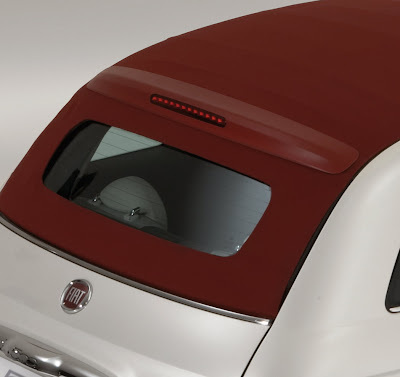 "A true object of design, the soft top of the Fiat 500C stands out for its elegant electrically controlled movements and its impressively finished and carefully selected technical features, from the glass rear window to the third brake light built into the soft top itself. Available in three colors (ivory, red and black), the clever soft top is matched with various paint finishes including three ad-hoc creations: a pearlescent Ragamuffin Red, a Tech House Grey so typical of sporty super cars, and Goth-Metal Blue (the latter available for the whole range)." "...The Fiat 500C has an exclusive feel to its interior, which is embellished with top quality and highly desirable fabrics, including Frau leather upholstery, and a long list of market-dependent standard and optional features: from automatic climate control to the innovative Interscope HiFi System, from the Blue&Me Map portable navigation unit to the smart wind-stop, and from the Start&Stop system to the new collection of customizable options." Two years after the launch of the sedan and continuing now with the new 500C convertible, the Fiat 500 is still getting rave reviews. 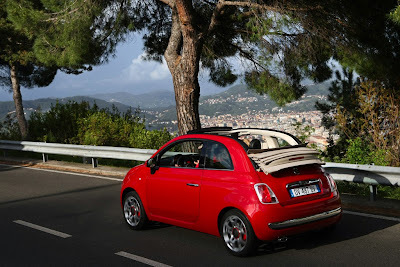 "...the Fiat 500 continues to be talked about and confirms its status as a real Italian style icon, able to win over the public and critics worldwide. The best evidence of its success are the 30 awards it has won across the globe, the 11 million Internet users that have visited its website (viewing a total of 200 million pages) and the more than 360,000 orders so far received across the 59 markets in which it is being sold." 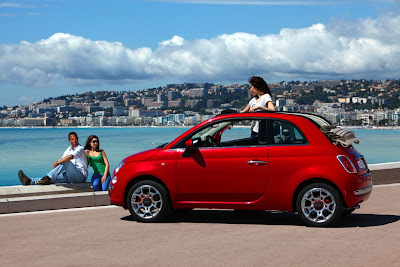 "In short, as an expression of Italy's finest automotive design, the 500 is not merely a super-compact city car, but a real platform upon which Fiat Automobiles is building a whole family of cars with advanced technology and high attention to detail. 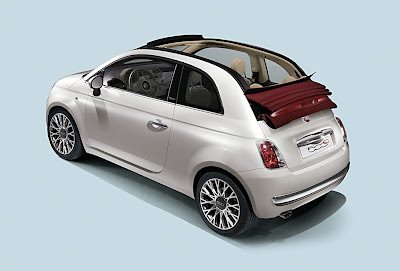 The new 500C represents another step forward in this direction." 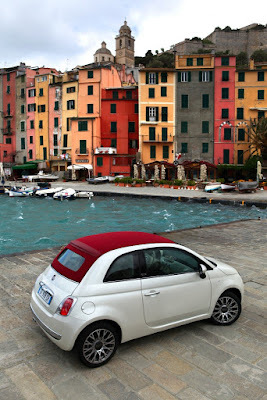 We are definitely in for a treat when we get cars like the Fiat 500C here in the USA. Today the Fiat 500 is two years old and it is still going strong. Plenty of interest and lots of awards points to the fact that this Fiat, like the original, will go down in history as a landmark design. Two years ago in Torino, Italy, Fiat unveiled the 500 in a truly spectacular manor. 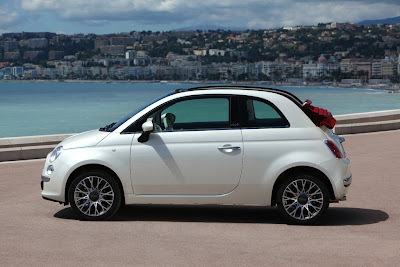 If you couldn't be there then, here are the videos from the Fiat 500 launch. Special thanks to the fellow enthusiast for posting these on youtube for all to enjoy!